Tradescantia tharpii Anders. & Woods. Stems: Erect, rarely branched, 1 to 4 inches tall when flowering, to 12 inches tall in fruit, soft hairy; nodes 1 or 2; internodes to 3.2 inches long. Leaves: Alternate, simple, not waxy, linear-lanceolate, 6 to 12 inches long, to 1 inch wide, densely covered with long, soft hairs; margins entire, often rose-purple or translucent. Inflorescences: Cymes, umbel-like, many-flowered, terminal; bracts grass-like, to 10 inches long, 1 inch wide, soft hairy. Flowers: Stalks 1.5 to 2.5 inches long, soft hairy, rose colored; sepals 3, broadly elliptic, 1/2 to 3/5 inch long, usually rose colored, soft-hairy, tips pointed; corollas about 1 inch wide, purplish blue or deep rose; petals 3, broadly ovate; stamens 6, filaments densely bearded. Fruits: Capsules, rounded; seeds oblong, flattened, gray, about 1/10 inch long. Habitat: Prairies, hillsides, thickets, and open woods, most abundant on rocky or clay soils. Distribution: Principally central of Kansas. Comments: Named after Benjamin Tharp, 1885-1964, a botanist at the University of Texas. 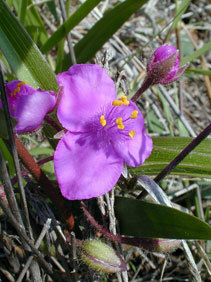 Three other spiderworts are observed in Kansas: prairie spiderwort , bracted spiderwort , and common spiderwort .